Nature in Feet emandangan Mountain Tours in Coral Prima Donna Pandeglang District EnJ Jakarta 17 April 2009 No. 1.055 views CommentPrint This Post PRINTEmail This Post EMAIL karangBanten mountain is noted for its rich potential for spiritual tourism. If the Old Banten Serang regency, for instance, visited by thousands of tourists every holiday because it has a heritage tourism area, the Sultan of Banten – which among other things contains Surosowan Citadel, Grand Mosque, the ancient temple and tomb of Sultan Hasanuddin, the Pandeglang District, 20 km from Kota Serang District, also known as a tourist area of Mount Reef. In the tourism business potential book Pandeglang District published 7 years ago, noted Mount Reef tourism has 3 objects visits. Object first visit is called the Well of the Seven. Object of the second visit, Swimming Pool equipped Cikoromoi Cibulakan penziarahan place. Penziarahan object was observed visitors to be interesting, because there dikolam Stone pemandiannya Koran, a large stone located in the bottom of the pool and read arabic letters. Estimated stone arabic letters were written over the age 5 centuries. And a third object called the visit a hot spring Cisolong. Compared with kunjugan object Cikoromoi pool, or hot spring Cisolong, the object of the visit and the Well Stone Seven Quran more frequently visited by Muslims on the holy days of Islam, such as the Birthday of Prophet Muhammad, 1 Muharram, before Ramadhan, Idul Fitri or Eid al-Adha. Thousands of Muslims are always visiting the spiritual tourist attraction in every holiday, because the historical existence of tourist attractions and Stone Well Seven Koran, is said, is closely related to the Sultan of Banten family activities in the spread of Islam in the 15th century. 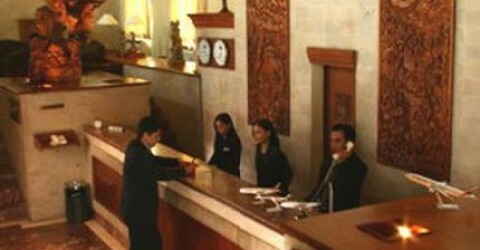 Therefore, a number of corporate travel agency in Java, especially institutions or assembly instruction in Jabotabek taklim, Banten, Bandung and Cirebon are often made of natural scenery at the foot of Mount Reef as attractive tourist destination. Because of the location, there are also attractions Stone and the Well of the Seven Koran. Interestingly again, at certain moments in the season, durian, durian sellers also appeared along the road to the foot of the mountain location of the reef began Ciasem, city or Cikoromoi Pandeglang. Long story about the mystery of the Seven wells will be removed in a separate paper. Then, what tourist attraction Stone baths Qur’an? To find out, maybe you can learn recognition Wahab Haji Gaffar (57) from Mataram, West Nusa Tenggara. Wahab Haji Gaffar, a retired government employee Tk I Nusa Tenggara Barat was admitted that he had since college at the University of Gajah Mada in 1960 to hear a variety of baths Cibulakan appeal. Therefore, the grandfather of 6 grandchildren are 4 children vow that retirement will take time conducting spiritual tours to visit the tomb of Sunan Ampel in Surabaya to look at all the relics of the glory days of Sultan of Banten, including the Koran Stone’s bath. “When I saw myself, I just believe it, there qur’an stone. So, not a fairy tale made up. Stone Quran is one of the remaining relics of the heyday of the Sultan of Banten, “said Wahab Haji Gaffar. “Unfortunately, the administration seemed to let it grow attractions without treatment, so not impressed seperlunyam attractions that are meant for Muslims, especially for the history of assets in Banten,” he added. Location Quran bathing Stone Mountain is located at the foot of the Coral, precisely in the Village District Kadubumbang Cimanuk, Pandeglang district. Location is very simple bath. There was only a pond there. However, if the long vacation arrived, the queue of people coming to these baths. Visitors are always made wonder, because according to the story kuncen, Cibulakan bath attendant, bathing pool water – the height is only about 1.5 meters from the bottom of the pool – could dry season lasted even longer. Prof. Dr. Muarif Ambari from the National Archaeological Research Center also never learned how to drain the pond Cibulakan, then Stone studied the Koran there origins. Proved difficult. Because the water was not easy Cibulakan sucked dry despite pressure water pipes of hundreds of cubic feet per hour. As a result of the archaeological historians believe that the stone bearing the letters of al-Quran is in the rocks on the bottom Cibulakan, deliberately created by the followers of the Sultan of Banten in the framework of Islamic syiar. The stones have been used as media for the followers of the Sultan of Banten tentantg residents how to respect water to drink, how to be menghormatyi ablution water, and how to make water as the capital of life. Lettered stones arab, the width is only about 2 meters. On the edge of the rock, there are a number of heavy spring and clear water. At that same location, visitors often linger bath. “There is a very confident, if you soak in the surrounding rock the Quran, there is a skin disease that can easily be cured body. There is also a confident, often soaking in the pool Cibulakan skin will be cleaner because the pool water Cibulakan chemical element that can smooth the skin. There is also a sure, the pool water can be Cibulakan cure a variety of media in the form of the disease, “said Haji Ahmad from Mount Public Lebak District who claims often take students-students of pesantren musholla Koran together in the existing pond on the outskirts of Cibulakan. Haji Ahmad said, often took santri Koran together in musholla Cibulakan, more because I wanted to explain many things that the Stone of the Quran is in the pool is a relic Ki Cibulakan Mansyur, a famous scholar in the Banten sultanate era to the 15th century. Ki Mansyur – which is also called Maulana Mansyur by the residents of Jakarta – was one of his brave scholar, intelligent, good at playing instruments bernafaskan Islamic art. In the heyday of Sultan Hasanuddin, Ki Mansyur who also qualified in agricultural science and communication tasks entrusted to safeguard the Islamic area of South Jakarta and domiciled in Cikaduen. During the assignment, Ki Mansyur lot of science left to the citizens of South Jakarta. One of the science of Islamic art bernafaskan left behind and still is sustainable Rampak Bedug art, traditional art that were originally used only on the residents of Pandeglang Ramadan to wake people meal. Art is also used as a tool to gather the masses ahead of Ki Mansyur messages or tasks to the people. Ki Mansyur Debus also pass the science, the essence of art that comes from the Qur’an, for the spread of Islam. Ki Mansyur now – with his wife – bersemayan in Cikaduen. Every holiday, especially if the Birthday of Prophet Muhammad came, dozens of large buses from various city park in penziarahan tourist sites in the tomb of Ki Cikaduen Mansyur, Pandeglang. After visiting the tomb of Ki Mansyur, the tourists are also often took time to soak in the pool Cibulakan. When he came home, visitors also brought gifts bottle of water from the pond Cibulakan. And activity seemed to be becoming a long tradition. The result was amazing. Because very confident, rock bathing pool water can be used as drug Quran, many visitors who had been suffering from skin diseases are now cured. illum quis suscipit dolor nonummy in dolore.